My daily rhythms are no longer calibrated to the academic year, but my body, mind and spirit still greet September with a sense of welcome–a new season is beginning with new opportunities, new chances, even new people. I am creating a new address book, which for the moment has no crossed out addresses and phone numbers. I have perused my refrigerator door, deciding which postcards, magnets and pictures can be retired in light of the present moment. I have new calendars, ones that represent this fall season and ones I anticipate putting in use when January comes. I have found myself rearranging the tray on the table where I pray with new symbols representing the focus of my heart. Some parts of my spiritual practice remain energizing and provocative–my prayers with a calendar of art that changes weekly, my happiness diary given to me by my daughter. But some of the other routines, books and rituals are a little dusty, so I am examining what needs to stay and what can give way to something different–maybe even already used–that can bring me into a deeper awareness of Holy Presence. On the other hand, my list of people and worlds events that need Divine Attention gets wider and longer. I have become so impressed with the up-closeness we have to all other humans and the groaning of all of creation. The needs of the particular and the general spill out into my awareness in a flood of anguish and despair; there are days in which I feel as if it is so much that I need to throw in my prayer towel. Yet, I believe that I need to be constant in two kinds of prayer–that which faces inward, opening myself to the Beloved, saying “Here I am, Loving God;” and that which participates in healing the broken threads of the world in lifting it to the Light. Again, I may need to slow down, be willing to take the time that is worthy of this holy ministry, maybe in this part of my life, the most important thing that I do. I need guidance in showing me how to lengthen my attention span and deepen my compassion. And once again, I wake up to the fact that my body need to be part of my spiritual practice–my labyrinth, my neighborhood, my stretching, my piano playing, my healthy eating, my reaching out to those around me–beloved, friendly, or folks unknown. I am learning how to understand that all of my life is a spiritual practice, if and when I can pay attention to the Light within it. Some things I will continue to do as I have done, yet I want to expand my soul, become more elastic and welcoming. Work still to do! 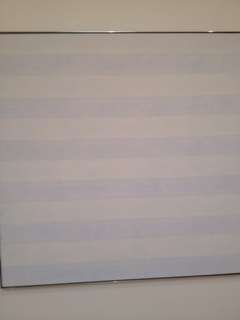 The picture of the painting by Agnes Martin above resides in a museum in Taos, and is called “Friendship.” But this week it is reminding me of the blank notebooks with which the school season begins, blank spaces to fill with inspiration and learnings yet awaiting me as I open myself to this new year of learning with the Spirit. Maybe this year I can choose again with Rilke to “Resolve to be always beginning–to always be a beginner.” From that posture I can once again learn that God is making all things new, Holy Mercies are new every morning, and this new year is a gift of living into a new thing that the Spirit is doing in me. You have such a way with putting together holy words…which invites the reader to dive deeply into the wisdom shared. Thank you!